I. Love. Angel food cake. It has always been a favorite dessert of mine, and I can still recall making my very first one from scratch many years ago. I was at my Grandma Lorrie’s house, and I remember standing on a stool with a hand mixer in my right hand and mixing and mixing and mixing and mixing… just waiting for those darn stiff peaks to form. I must have asked my grandma five or six times if I had “stiff peaks” before I actually did. In reality, it probably didn’t take long at all. But when you are little, holding a heavy hand mixer, and really wanting some cake, those five or six minutes can feel like an eternity. I had a craving for some angel food cake the other day, as I often do in the late spring when the strawberries are ruby red and sweet, and I decided to get baking. However, when I looked in my refrigerator and discovered that I only had seven eggs I realized that I had a problem; my recipe calls for 11 egg whites. This is where the cupcakes come in. Determined to get my angel food cake fix in some shape or form, I scaled down my recipe considerably and made them as mini cakes instead. Remarkably, I still got 20 cupcakes…go figure. 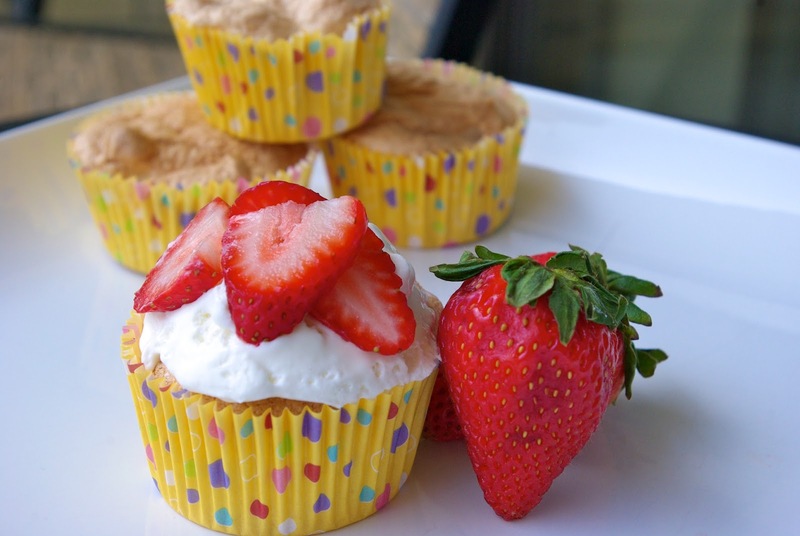 These angel food cupcakes are delicious. They completely melt in your mouth and are as light as air. They are the perfect sweet after dinner or when you need a treat in the middle of the day. 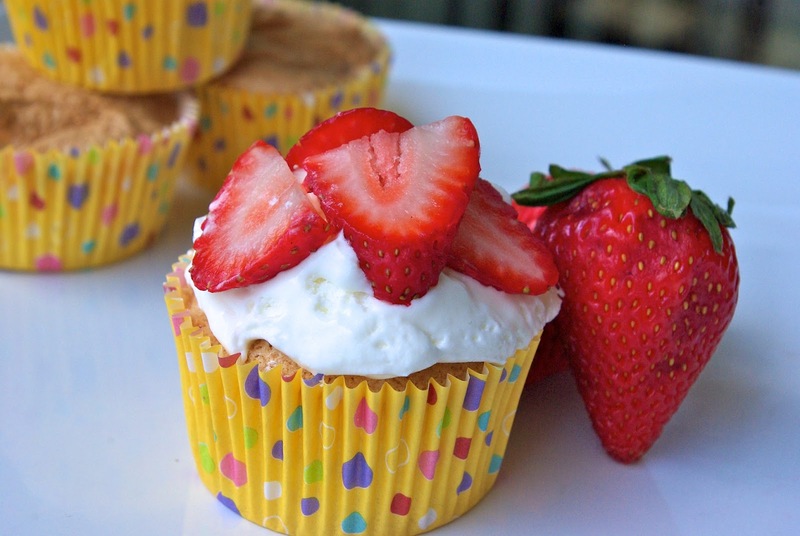 Give them a try with a dollop of whipped cream and topped with your favorite berries, you wont be sorry. As a side note, be sure to check back later this week for another new blog post AND AN EXCITING GIVE AWAY! What is your favorite spring/summer time dessert? Let me know below! mixing bowl and set aside. sugar and flour together three times. Set aside. fold in flour mixture, one third at a time, to the fluffy egg whites. are golden brown in color. Top with whipped cream and berries, if desired, and enjoy!